iPhone 4S is the latest generation of Apple iPhone. Powered by Dual-core Apple A5 chip and iOS 5, the iPhone 4S is said to be 2x faster performance and 7x faster graphics than iPhone 4. Moreover, it supports 1080p HD video playback with 960-by-640-pixel resolution which will bring users a great visual enjoyment. So, video formats including H.264, MPEG-4 can be imported directly to iPhone 4S for playing, and video formats in other formats need to be converted to iPhone 4S supported formats before video enjoyment. World's Fastest Converter! Intel QSV Built-in! World's first video transcoder for Mac to support Intel QSV/Nvidia/AMD HW acceleration tech to speed up video to iPhone conversion with World's fastest speed (5X faster than any other converters). 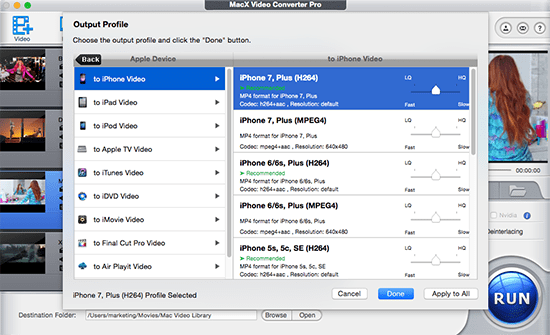 MacX Video Converter Pro can decode almost all popular video formats including AVI, WMV, FLV, MOV, HEVC, MTS, MKV to iPhone Xs/X/8/7/6s/6/Plus, etc without quality loss. The advanced Intel QSV/Nvidia/AMD hardware acceleration tech support guarantees the world's fatest speed, up to 5x faster than others to convert the videos to iPhone 4S. Universal and fast, it makes any videos suitable for iPhone 4S in three clicks. 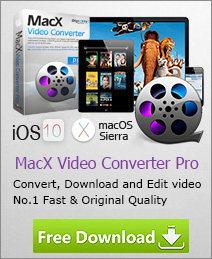 After you have downloaded, installed and run this video to iPhone converter, you can either click on the "Add File" button to load video or directly drag the video to it. Then you can have a preview of the video with the built-in video player on the left. Batch video conversion is supported. Step 2. Choose "to iPhone"
Click on the "to iPhone" button and choose the desired profile among the drop-down profile. There are many profiles suitable for any iPhone versions: iPhone, iPhone Xs Max/Xs/XR/X, iPad Android etc. Specify an output folder on your computer to save the output files. Click "Browse" button to choose the path where you want to save the output files in. Click the "RUN" button to start decoding video to iPhone 4S. The super video conversion speed will help you get the wanted videos within the shortest time. Then you can transfer the videos to iPhone 4S via iTunes. With this program, you can enjoy common video, watch HD video on iPhone 4S freely. Besides converting HD and SD videos to iPhone 4S, iPad, iPod, it can also features a strong function to free download online videos movies in 4K UHD/HD with superfast speed from 1000+ sites like YouTube, Metacafe, Break, etc.